After I upgraded to latest stable node and npm, I tried npm install moment --save. It saves the entry in the package.json with the caret(^) prefix. Previously, it was a tilde(~) prefix. Why are these changes made in npm? What is the difference between tilde(~) and caret(^)? What is the advantages over others? In the simplest terms, the tilde matches the most recent minor version (the middle number). ~1.2.3 will match all 1.2.x versions but will miss 1.3.0. The caret, on the other hand, is more relaxed. It will update you to the most recent major version (the first number). ^1.2.3 will match any 1.x.x release including 1.3.0, but will hold off on 2.0.0. Note that the author's terminology is somewhat misleading: when he says "the most recent minor version" for ~ he means "the most recent patch version in the specified minor version". Similarly for ^, "the most recent major version" should be read as "the most recent minor version in the specified major version". Npm allows installing newer version of a package than the one specified. Using tilde (~) gives you bug fix releases and caret (^) gives you backwards compatible new functionality as well. The problem is old versions usually don't receive bug fixes that much, so npm uses caret (^) as the default for --save. According to: "Semver explained - why there's a caret (^) in my package.json?". Note that the rules apply to versions above 1.0.0 and not every project follows semantic versioning. For versions 0.x.x the caret allows only patch updates, i.e. it behaves the same as the tilde. See "Caret Ranges"
~ fixes major and minor numbers. It is used when you're ready to accept bug-fixes in your dependency, but don't want any potentially incompatible changes. ^ fixes the major number only. It is used when you're closely watching your dependencies and are ready to quickly change your code if minor release will be incompatible. In addition to that, ^ is not supported by old npm versions, and should be used with caution. So, ^ is a good default, but it's not perfect. I suggest to carefully pick and configure the semver operator that is most useful to you. Alternatively, use SemVer Check instead, which doesn't require you to pick a package and also offers explanations. Use ^ (like head). Allows updates at the second non-zero level from the left: ^0.2.3 means 0.2.3 <= v < 0.3. ~1.2 means 1.2.0 <= v < 1.3.0. ~1.2.4 means 1.2.4 <= v < 1.3.0. You can set starting major version without specifying sublevels. Notice: Missing major, minor, patch or specifying beta without number, is the same as any for the missing level. Notice: When you install a package which has 0 as major level, the update will only install new beta/pr level version! That's because npm sets ^ as default in package.json and when installed version is like 0.1.3, it freezes all major/minor/patch levels. Hat matching may be considered "broken" because it wont update ^0.1.2 to 0.2.0. When the software is emerging use 0.x.y versions and hat matching will only match the last varying digit (y). This is done on purpose. The reason is that while the software is evolving the API changes rapidly: one day you have these methods and the other day you have those methods and the old ones are gone. If you don't want to break the code for people who already are using your library you go and increment the major version: e.g. 1.0.0 -> 2.0.0 -> 3.0.0. So, by the time your software is finally 100% done and full-featured it will be like version 11.0.0 and that doesn't look very meaningful, and actually looks confusing. If you were, on the other hand, using 0.1.x -> 0.2.x -> 0.3.x versions then by the time the software is finally 100% done and full-featured it is released as version 1.0.0 and it means "This release is a long-term service one, you can proceed and use this version of the library in your production code, and the author won't change everything tomorrow, or next month, and he won't abandon the package". The rule is: use 0.x.y versioning when your software hasn't yet matured and release it with incrementing the middle digit when your public API changes (therefore people having ^0.1.0 won't get 0.2.0 update and it won't break their code). Then, when the software matures, release it under 1.0.0 and increment the leftmost digit each time your public API changes (therefore people having ^1.0.0 won't get 2.0.0 update and it won't break their code). You probably have seen the tilde (~) and caret (^) in the package.json. What is the difference between them? When you do npm install moment --save, It saves the entry in the package.json with the caret (^) prefix. In the simplest terms, the tilde (~) matches the most recent minor version (the middle number). ~1.2.3 will match all 1.2.x versions but will miss 1.3.0. The caret (^), on the other hand, is more relaxed. It will update you to the most recent major version (the first number). ^1.2.3 will match any 1.x.x release including 1.3.0, but will hold off on 2.0.0. Tilde ~ matches minor version, if you have installed a package that has 1.4.2 and after your installation, versions 1.4.3 and 1.4.4 are also available if in your package.json it is used as ~1.4.2 then npm install in your project after upgrade will install 1.4.4 in your project. But there is 1.5.0 available for that package then it will not be installed by ~. It is called minor version. Caret ^ matches major version, if 1.4.2 package in stalled in your project and 1.5.0 is also available then ^ will install major version. It will not allow to install 2.1.0 if you have ^1.4.2. Fixed version if you don't want to change version of package on each installation then used fixed version with out any special charater e.g "1.4.2"
Latest Version * If you want to install latest version then only use * in front of package name. ~ fixes major and minor numbers. It is used when you're ready to accept bug-fixes in your dependency, but don't want any potentially incompatible changes. The tilde matches the most recent minor version (the middle number). ~1.2.3 will match all 1.2.x versions, but it will miss 1.3.0. ^ fixes the major number only. It is used when you're closely watching your dependencies and are ready to quickly change your code if minor release will be incompatible. It will update you to the most recent major version (the first number). ^1.2.3 will match any 1.x.x release including 1.3.0, but it will hold off on 2.0.0. Caret (^) gives you backwards-compatible new functionality as well. The version number is in syntax which designates each section with different meaning. syntax is broken into three sections separated by a dot. 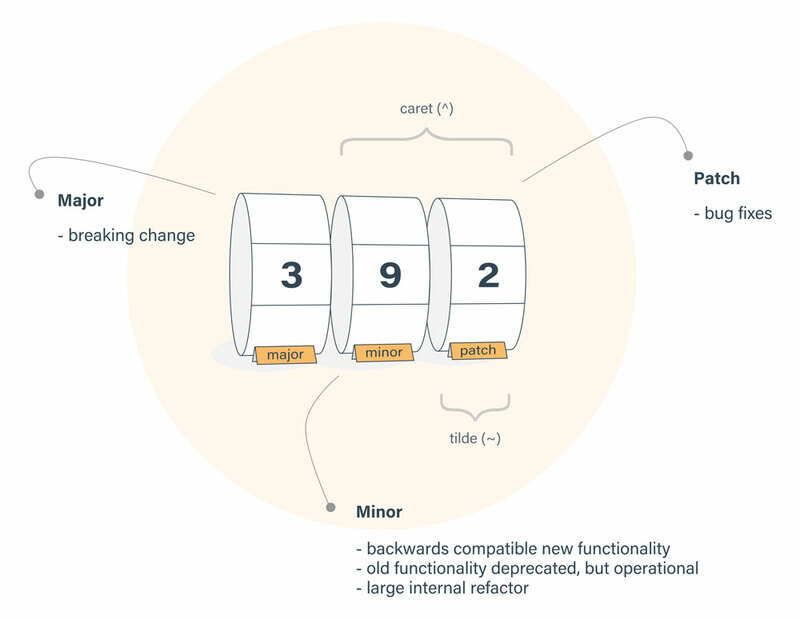 Major, minor and patch represent the different releases of a package. npm uses the tilde (~) and caret (^) to designate which patch and minor versions to use respectively. So if you see ~1.0.2 it means to install version 1.0.2 or the latest patch version such as 1.0.4. If you see ^1.0.2 it means to install version 1.0.2 or the latest minor or patch version such as 1.1.0. Not an answer, per se, but an observation that seems to have been overlooked. Allows changes that do not modify the left-most non-zero digit in the [major, minor, patch] tuple. I don't think that's what they meant. Pulling in versions 11.x.x through 19.x.x will break your code. I think they meant left most non-zero number field. There is nothing in SemVer that requires number-fields to be single-digit. Not the answer you're looking for? Browse other questions tagged node.js npm package.json semantic-versioning or ask your own question. What are the prefix symbols “^”, “~” and those without in the package version in package.json files? What does the ^ mean for spec attribute in PhoneGap plugin? How do I fix the npm UNMET PEER DEPENDENCY warning? How to install a specific version of package using Composer? What is the difference between yarn.lock and npm's shrinkwrap? Difference between latest and tilde (~) in npm package.json file?